This size two ball is the same design as a regular soccer ball, only smaller. It's perfect for rolling around inside, and is more convenient for youngsters to carry around with them. Whether your toddler wants his or her very own soccer ball to be "just like Big Brother", or your kindergarten class would like to play a fun and safe game of soccer in the gym or out on the playground, this is a perfect introductory choice. We recommend it for children eight and under. 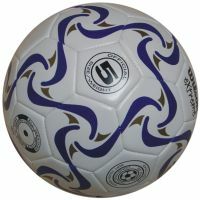 This size three soccer ball is an extremely popular choice for kids. It's a little larger than our smallest Keepaway soccer ball, and is often used in soccer leagues and clubs for students in kindergarten through second or third grade. 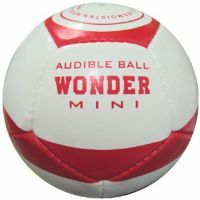 The mini soccer ball is made with a matte-finished PVC material, ideal for both training and children. The new-and-improved soft PVC surface is perfect for indoor and Astro-Turf use, as well as for outdoors in a backyard, soccer field, empty parking lot ... This durable and sturdy - yet small and portable - audible soccer ball is so practical that we're sure you'll be packing this one every time you go for a drive or on a camping trip with the kids - just as we do! Two large bells inside the ball make noise whenever it is in motion. Join in that game of soccer (or football), just like you've always wanted to. Soccer (or football, as it's known in the rest of the world) is probably the easiest ball game for blind players to participate in. The only real difficulty blind folks face is knowing where the ball is. Well, do we ever have a solution for you! Our authentic, industry-standard soccer balls are just like those you'd find in your local department store or sporting goods shop; they're identical to the ones used by amateur and professional soccer players alike across the country (and around the world). There's only one slight difference between our audible soccer balls and the ordinary ones you'll have around your school or home. It's a basic yet powerful difference that allows EVERYONE to share in the simple joy of kicking a ball around - for fun or in the name of competition. The modification we speak of is that each of our balls has a number of jingling bells inside, so everyone will know where it is whenever it's in motion. Whether the ball is in the air, has just landed, or is rolling across the grass, it makes a pleasant tinkling sound that's easy for blind players to hear ... and follow - and locate! So if you want to play the official game of Soccer, kick a ball around the yard, or just have a quick game of catch, this ball is the perfect choice. Never before offered at this unbeatable price, you're getting a top-quality ball ... that everyone can play with.